So it's been on and poppin on the Shop Hush app these last few months. 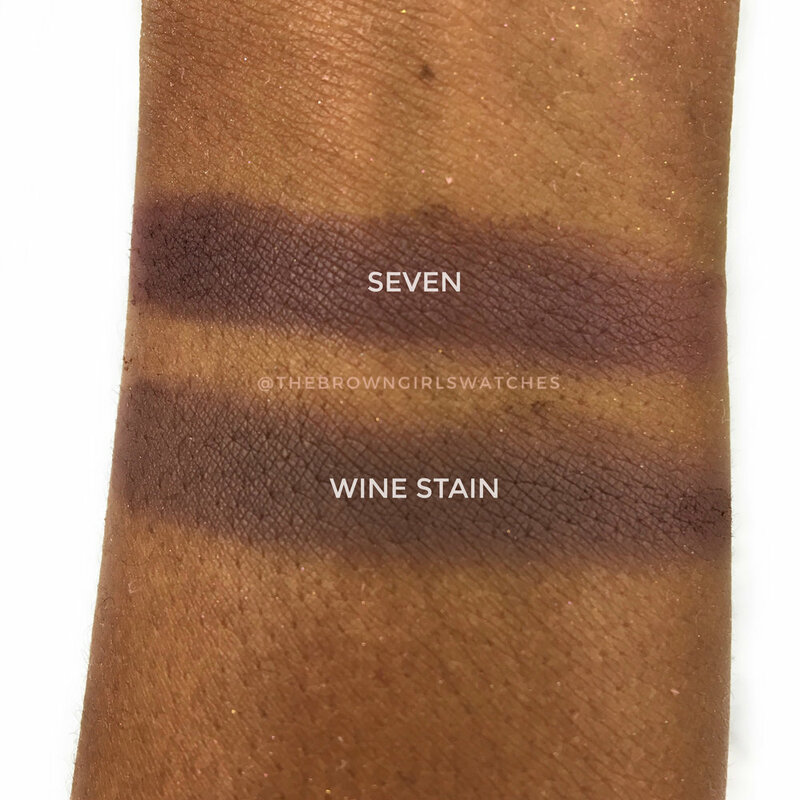 If you have been following the Brown Girl Swatches blog and Instagram you know the deal. Today I am bringing you guys a dupe COLLECTION! That's right. 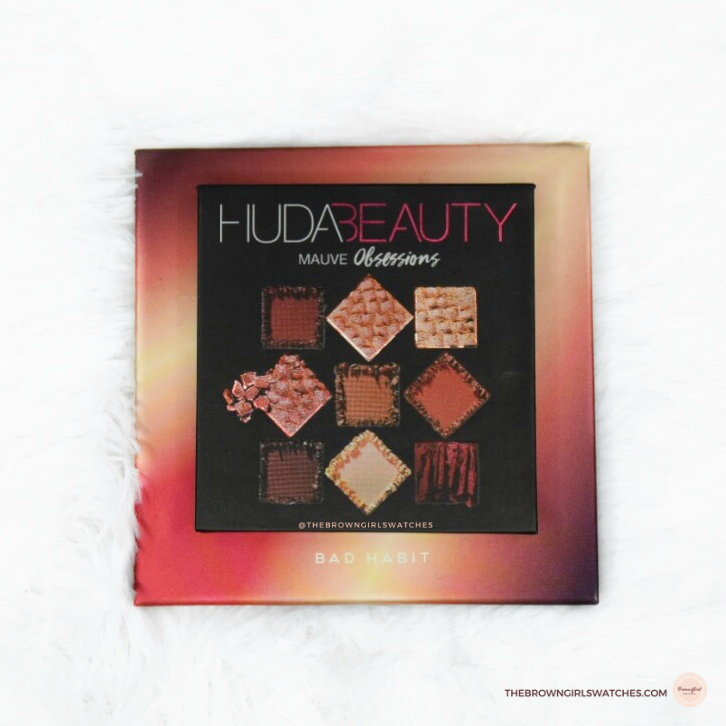 Not just "one palette", but the all four Huda Beauty Obsession palettes have been duped by Bad Habit Beauty. The palettes are called "The After Collection" and the entire collection can be purchased for $30 or $10 per palette individually. This is a bomb deal considering one Huda Beauty Mauve Obsessions palette retails for $25 at Sephora. NOW to be clear, a dupe is not a replica. Replicas are known for their dangerous ingredients and mass production. A dupe, on the other hand, is made by real brands and offers a similar color range to an existing mainstream palette. Dupes are so similar its often hard to tell the colors apart from the originals. 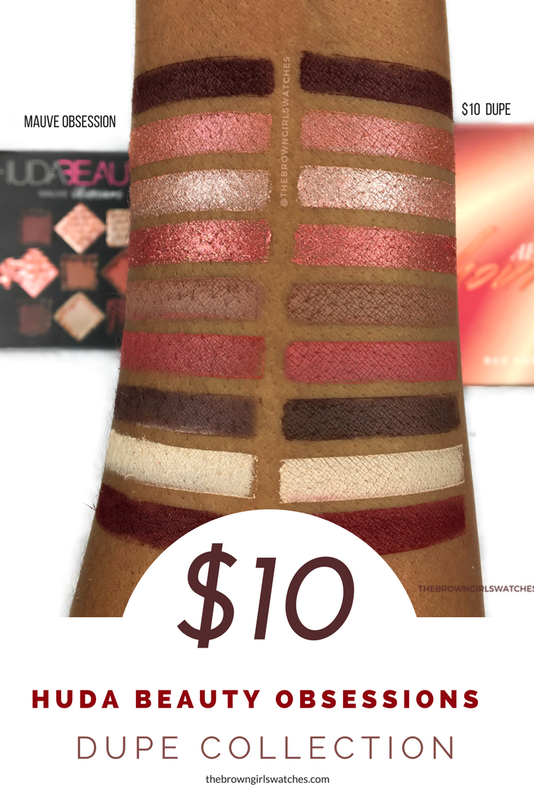 Now lets take a deeper look into this new cheaper option of the Huda Beauty Obsessions Palette color schemes. You see this collection tho?! Girl, Bad Habit Beauty did not come to play games with the release of the After Collection. As the above swatches show, we are working with bomb packaging, pigmentation, and some pretty spot on dupes. Let's get critical though! I'm going to compare the Huda Beauty Mauve Obsessions Palette and The Bad Habit After Hours palette shade by shade. I'm also going to drop some pros and cons of the After Collection and Obsessions Palettes. When taking a look at packaging, the texture of both palettes are very similar. They have soft black casing with a magnet inside that holds them shut when closed. The major difference is the size of the palette and the mirror size. The Huda Obsession palette is significantly smaller and has a smaller mirror. The Obsessions palettes are similar in size to a sticky note pad. The After Collection also has names to each shadow, and the pans are the same size as the Huda Palette. I love the After Collection Packaging because its still small and travel friendly, but the mirror is super nice and honestly that gives it a leg up! What about those pigments tho?! Let's see how they compare. Off hand, when looking the After Hours palette looks Spot ON! However, once you dig compare shade by shade you start to see slight differences in color and performance. For the Mauve Obsessions and After Hours, I'm going to break down each shade from left to right in the Huda Beauty Mauve Obsessions Palette beginning with the top left shade. Since Huda's palette doesn't have names, I have numbered the colors in the palette for reference. 1 vs Hickey: The first shade in the Huda Beauty Mauve obsessions palette has more purple tones than Hickey, but overall this a pretty spot on dupe. In application, both colors have fallout, but Hickey is slightly more powdery and soft. It is easy to get more kickback and fallout with Hickey so it should be used with a light hand. Pigmentation wise, Hickey is a little more pigmented and easier to swatch, but not easier to apply to the eyelids. 2 vs Eye Contact: These two shades are identical in color. Eye contact applies to the eyes more faint than color number 2 in the Mauve obsession when using a brush. For best results I reccomend using your finger or wetting your brush. Clutch is actually more pigmented than shade 3 in the Mauve obsessions palette. Both shades are very creamy, but Shade 3 sticks better to the eyelid. As mentioned earlier, applying with your finger, wetting your brush, or using a primer will all help with Clutch's application. Shade four and Gossip.... yeah girl there is no difference. Bomb dupe. Same application recommendations as previously mentioned. Lustful is slightly darker than shade number 5, but both apply and look the same on the eyes. Bomb dupe! No real color difference here especially when applied to the eyes. Wine stain is slightly darker than seven and a little more on the brown side, but these colors look really similar. Wine stain doesn't melt into previously applied shades as well as seven. You have to be very careful not to apply this to harshly or it will be patchy. It doesn't stick as well as seven does to the eyes. Eight clearly swatches better than Powder Room, but when applied to the eyes there is NO DIFFERENCE. They look the same. Nine is a little deeper than Cabernet with more burgundy tones. Cabernet is brighter, but when applied to the eyes they look so similar its hard to tell them apart. The shimmer shades are take some finessing to get maximum color payoff and smooth application. You cannot use the shades without primer, a wet brush, or glitter adhesive. The color will wear off and eventually be non-existent. The colors are very pigmented, but they do not blend together as easily as the Huda Obsessions collection. You need to use the proper brushes to avoid patchiness and to get the pigments to stick to the eyelids. Again, primer is essential for this to work at it's best. There is fallout and kickback. If you are heavy handed with products and a little rough with blending this can get muddy real quick. I haven't had that issue because I tend to build up color and apply neatly. However there will be a learning curve if your more on the messy side. The amount of kickback and fallout is significantly greater than Huda's collection. To be clear, Huda's collection does have fallout, but Bad Habit's collection is softer and more powdery although it is just as pigmented. Overall, The After Collection are pretty solid dupes! At $10 a palette you really can't beat it. I am one who doesn't mind spending cash for quality, but now that I have tested both the Obsessions and The After Collection, I can say I am content with the After Collection. I really wanted the Smokey Obsessions, but couldn't justify spending another $25 on such common colors I probably already have in my stash. With this After Collection bundle I was able to get my Smokey colors in a travel friendly palette alongside 3 other gorgeous palettes and FOUR MIRRORS for $30 and free shipping. Girl, I don't even know why your still reading this because your for sure need to swoop these up! WHICH ONES ARE YOUR FAVE FROM THE AFTER COLLECTION?